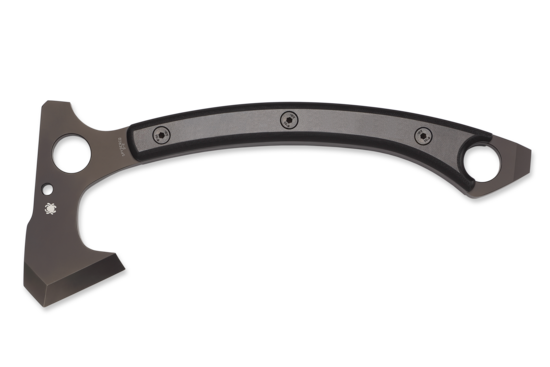 Genzow HatchetHawk™ - Spyderco, Inc. Page 1152 – Spyderco, Inc. Designed by German outdoor enthusiast and historian Martin Genzow, the Genzow HatchetHawk is a versatile, high-performance utility tomahawk that integrates the best features of the traditional Francesca Frankish axe, the classic bearded axe, and the tomahawk and expresses them with a dynamic fusion of old-school craftsmanship and state-of-the-art materials and engineering. The HatchetHawk’s head is drop forged from tough 5160 tool steel, meticulously heat treated to ensure optimal performance of all its working surfaces, and hand finished to exacting specifications while maintaining the slightly rustic character of its forging. Its bearded profile, raised toe, and slightly canted edge angle provide a long working edge that is ideal for both chopping and detailed cutting chores. A hammer poll excels at tasks that require focused impact instead of a sharp edge and helps create an exceptional balance that maximizes the tool’s power. 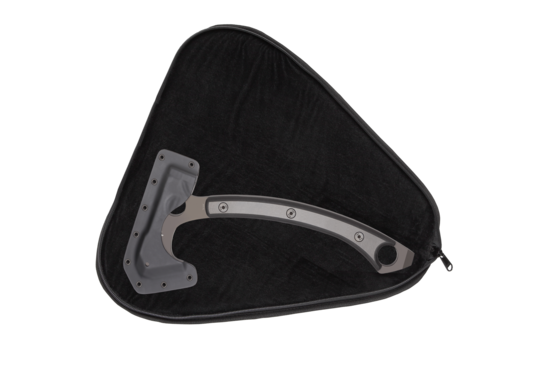 Made from polypropylene plastic injection molded over a rigid aluminum core, the HatchetHawk’s handle has an oval cross section and scientifically contoured shape that ensure maximum energy transfer and outstanding control. When not in use, the HatchetHawk and its owner are protected by a handcrafted heavy leather sheath with a snap-fastened leather strap. A loop on the back of the sheath allows convenient belt carry, while grommets in the sheath body will accept a cord or strap for over-the-shoulder carry like a classic baldric.